Home Costs > How Much Does an Attic Ladder Installation Cost? How Much Does an Attic Ladder Installation Cost? Foldaway stairs, also known as pull-down folding stairs, are designed to make it easier to access your attic. These units come completely framed with a folding, sectional ladder, which is designed to be installed inside of a ceiling opening. How much does attic ladder installation cost? The cost of installing an attic ladder will depend on the complexity of the setup, where you live, the ceiling height and who you hire. For example, if you already have an existing setup and your ladder needs to simply be replaced, it could cost $300 to $450 as long as no modifications need to be done. This is the price range for the typical folding or rigid ladder. If you carpenter or handyman has to open up a wall to provide a slope or build a ladder into the wall due to space, then the costs could increase to $450 to $750. In the end, for a new attic ladder, plan on spending $100 to $200 for the ladder and another $250 to $550 for the professional installation. While most install jobs will be fairly straightforward, it doesn’t hurt to receive multiple quotes from licensed contractors in your area. At HomeAdvisor.com, for example, you can explain your job and multiple contractors will contact you with free quotes. DIYorNot.com mentions you can save up to 66 percent if you were to do it yourself, but if you were to hire a professional handyman, then the costs for the average install could be about $657. Lowe’s, aside from purchasing the attic ladder, has been said to charge $150 for the job. As for the stairs alone, be prepared to spend $100 to $300, depending on the brand and materials. Ladders are typically made from an economical wood, steel or lightweight aluminum, with wood often being the cheapest option. For instance, on Amazon.com, without any professional installation, the top-rated ladders retail for $90 to $240. At Menard’s, the average attic ladder retails for $85 to $200. Almost all ladder attic installation jobs are either done by a carpenter or handyman, and the estimates above should include removing the existing ladder, installing the new ladder, installing the wood trim and cleaning up the work site. 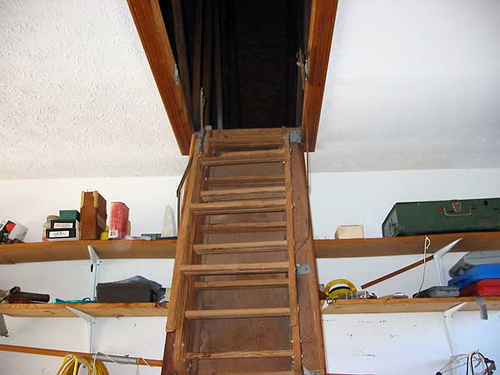 Unless you’re replacing an older attic ladder, a new ladder, when installed, will need a large hole cut inside of the ceiling and are reinforced with headers without destroying the strength of the joists. The unit is then bolted into the opening and trimmed with molding and paint to finish the look, allowing it to blend in. Ceiling heights commonly range from eight to 10 feet, but there’s also a 12-foot model designed for a higher ceiling. If the contractor had to re-route the air ducts, water pipes and/or remove insulation, then costs could increase depending on the circumstances. Some may charge an additional fee for painting and/or installing the molding outside of the install. Contractors advise against cutting into any roof support trusses unless the design was completed by a structural engineer. If a handyman or even an experienced carpenter were to cut into the plain attic floor joists improperly without the advice of a structural engineer, then the roof may flatten out, pushing the walls apart. The normal attic floor joists, even though it may not seems like they are much, still are part of the structural support system for the roof. If you don’t have a set of stairs yet, then consider your options when choosing a new location. Ideally, this new room should be easily accessible and often works best in a large room or hallway. When getting quotes, some professionals will only quote the install only, not the ladder and install. With any professional job, always get an itemized estimate before committing. Try to gather as many quotes as possible to ensure you’re getting the best rate possible. Aside from the price, also make sure they are licensed, insured and have reputable reviews online. Some say the job isn’t as hard as it seems, especially if you’re replacing an existing ladder. This DIY Network guide shows you how to install an attic ladder.